This multidisciplinary collection integrates physics, chemistry, and biology as students engage in a diffraction lab to model the work of Rosalind Franklin, the British biophysicist whose pioneering work led to the discovery of DNA structure in the 1950's. Our eBook was inspired by "How Rosalind Franklin Discovered the Helical Structure of DNA: Experiments in Diffraction", an 2011 article in The Physics Teacher magazine authored by Braun, Tierney, and Schmitzer. 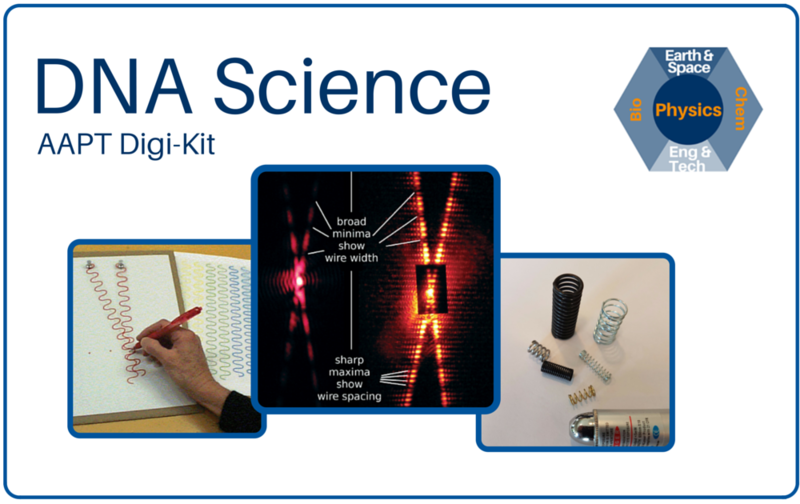 Learners will analyze light patterns produced by a laser as it passes through a ballpoint pen spring, then use mathematics and modeling to make inferences about the structure of DNA using Franklin's original "Photo 51" image. Original content, descriptions, and resource organization: ©AAPT, some rights reserved. See "About this book" for attributions.